$8500 for Lot 73, MAC DAGWOOD 178D, a red and polled 87.5% Salers bull sired by MAC Atomic Force 36A and out of a daughter of MAC Torrington 139T. Sold ½ interest and full possession to Silver Spur Salers of Maryville, MO. $8000 for Lot 9, MAC DEEP RIVER 86D, a black and polled purebred Salers son of MAC Centurion 240X and out of a daughter of MAC Lennox 314L. Sold to Burkle Ranch of Fredonia, ND. $8000 for Lot 21, MAC DECADE 140D, a homozygous black and polled purebred Salers son of MAC Union Station 87U and out of a daughter of MAC Centurion 240X. Sold ½ interest and full possession to Lazy SY Ranch of St. Xavier, MT. $8000 for Lot 51, MAC DEADWOOD 403D, a red and polled purebred Salers bull sired by MAC Atomic Force 36A and out of a daughter of MAC Wavelength 159W. Sold ½ interest and full possession to Hammond Ranch of Hardin, MT. $7500 for Lot 6, MAC DRIFTWOOD 300D, a black and polled purebred Salers bull sired by MAC Anders 29A and out of a daughter of KKCC Mercury 416P. Sold to ½ interest and full possession Bob Faulkner of Saratoga, WY. $7500 for Lot 15, MAC DISCOVERY 72D, a homozygous black and polled purebred Salers son of WHR Wyo Diamond and out of a daughter of MAC Torrington 139T. Sold ½ interest and full possession to Taylor Lund of Gackle, ND. $7000 for Lot 19, MAC DUNKIRK 112D, a homozygous black and homozygous polled purebred Salers son of WHR Wyo Diamond and out of a daughter of Big Sky Triton 40R. Sold to Chad Armstrong of Rolette, ND. $7000 for Lot 28, MAC DAVIE 207D, a black and homozygous polled purebred Salers son of THATS Zepplin 134Z out of a daughter of MAC Centurion 240X. Sold ½ interest and full possession to Wayne Bendixson of Evanston, WY. $7000 for Lot 30, MAC DESTINATION 244D, a homozygous black and homozygous polled purebred Salers son of MAC Anders 29A out of a daughter of MAC Torrington 139T. Sold ½ interest and full possession to Lazy SY Ranch of St. Xavier, MT. $7000 for Lot 72, MAC DIMENSION 161D, a red polled 87.5% Salers son of MAC Atomic Force 36A out of a daughter of MAC Torrington 139T. Sold to Stan Moore of Bartley, NE. $5500 for Lot 185, MAC DYNAH 289D, a black polled purebred Salers open yearling heifer sired by SRS Outback 0809X out of a daughter of MAC Topeka 159T. Sold to K-4 Cattle of Hereford, TX. 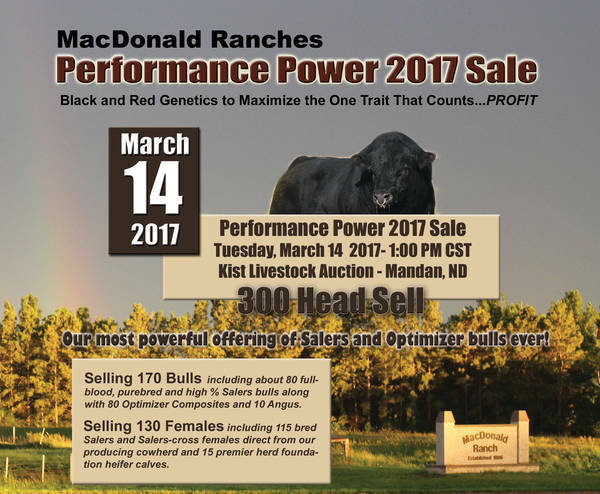 All proceeds donated to the American Salers Foundation Bill MacDonald Memorial Fund. $3000 for Lot 195, MAC DASHA 428D, a black polled purebred Salers open yearling heifer sired by MAC Blazing Star 184B and out of a daughter of OPP Eliminator 038X. Sold to K-4 Cattle of Hereford, TX. 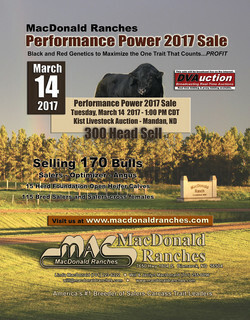 Click the picture to view the MacDonald Ranches 2017 video preview on YouTube. 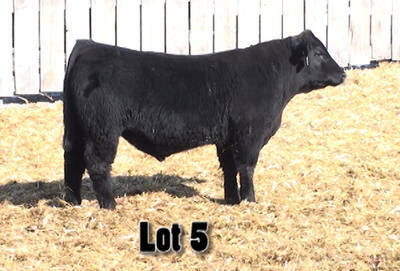 See all the bull and heifer calf lots in action!